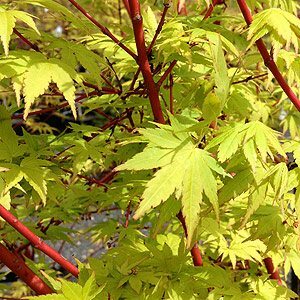 Acer palmatum ‘Senkaki’ – ‘The Coral Bark Maple’. One of the best ornamental maple trees is Acer palmatum ‘Senkaki’ (syn ‘Sango Kaku’), or the Coral Bark Maple. The brilliant new red stems that come to the forefront during winter but add interest throughout the year. This makes the Coral Bark Maple of standouts from the many Japanese Maples. Reaching a height of around 6m with a slightly narrower width to say 4.5m this is an upright tree that forms a naturally attractive vase shape. The botanical name is Acer palmatum ‘Senkaki’ also known as Acer palmatum Sango Kaku’. Attractive foliage through the the spring and summer and lovely buttery orange autumn colours all add up to making this a year round attraction. Foliage is bright green, five lobed with standout red stems. It is the bark of the tree that gives it its name, a really red coral reef tone that turns brown with age. Although the Coral Bark Maple is reasonably drought tolerant once established they will perform better when given a cool moist root run. Dig in plenty of well rotted compost 3 – 4 weeks before planting and ensure that drainage is good as they do not like waterlogged soils. 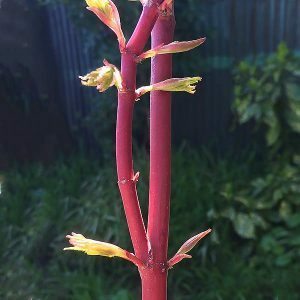 When planting young trees Acer palmatum senkaki should be staked to ensure an upright growth habit for the first 12 – 24 months especially in windy conditions. Growth rate is regarded ar slow to moderate, so established trees can be costly. A position where trees are protected from the heat of the afternoon sun is ideal. Water in well with a liquid seaweed fertiliser and continue with this every 2 weeks for the initial establishment period. Pruning of Coral Bark Maples is generally not required as they naturally grow to a nice shape. Any dead or damaged wood can be cut back using a sharp pruning saw. Errant or very low branches can be pruned if required. As a feature tree in any garden, in a Japanese garden use Acer palmatum ‘Sango Kaku’, or the Coral Bark Maple in a group or as a feature deciduous screen. In a courtyard in a large container. Use as a foil in with other Japanese Maples especially darker foliages varieties. How much will they cost ? From $40 – 50 for small Coral Bark Maples through to $500 for a larger 3-4m established specimens.